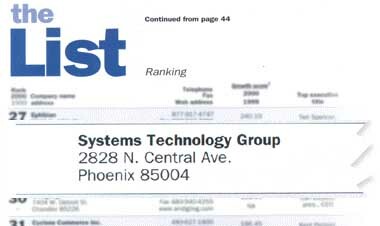 Systems Technology Group is proud to be recognized as one of the top information technology companies in Arizona. We work hard for you and we thank our peers and customers for their acknowledgement. Since our founding in 1994, STG has continued to grow and prosper because of our expertise, talented staff, strong sense of integrity and commitment to customer service. We work hard to create high quality, successful software and websites for our clients. All of our hard work has not gone unnoticed. Not to toot our own horn, so to speak, but we feel it is important that you have confidence in the company that you select as a partner. Below are some of the recent business and industry awards that STG has received.